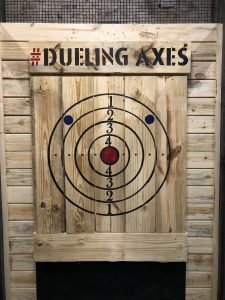 Participants in Dueling Axes leagues must be 18 years old or older. Junior leagues are being developed and information will be released soon regarding how these leagues will work. Targets should be relatively new and of sound quality prior to league commencement. When targets deteriorate to a point where excessive movement or ‘wiggling’ of the axes occur when they land in the damaged area causing or risking good throws to fall out, the boards should be switched out to ensure fair play. 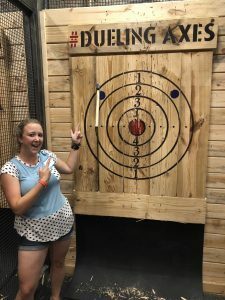 If a large piece of wood or chunk falls out during play, the player may request to have the board changed but the ultimate decision will fall on the axe throwing referee (coach). Targets must be sprayed with water from spray bottle prior to the start of league play. If boards are continually hard, league members may request to have more water sprayed on the boards. Players may have up to 5 practice throws prior to their first match. Players may have 1 practice throw prior to any subsequent matches. 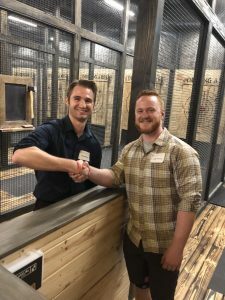 The axe throwing referee will notify players when their match will commence. The league will allow practice throws before official league start time subject to availability, fairness and consent of referee on premises. 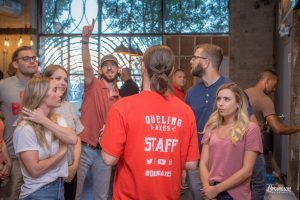 Each league night allows every participant 4 matches. In each match, players will take 5 throws then switch sides. This ensures fair play when there’s varying density in wood. The winner of the match will be the person with the most points after 10 throws. The players will throw again (11th time) and the winner will be the person that scores the higher points during that throw. If both players tie again, they must continue with sudden death throws until there is a winner. Points are not counted or tallied during sudden death. The match points and win/loss then be recorded and uploaded to the leaderboards. After 7 weeks, the 8th and final week of each season will be the playoffs and final match to determine the season champion. See Playoffs section for details. The black line awards points associated with the ring. 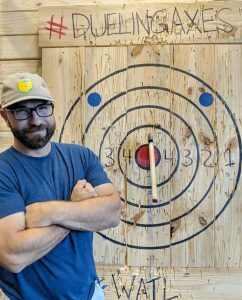 6 points for the bullseye. 4 points for the 2nd ring. 3 points for the 3rd ring. 2 points for the 4th ring. 1 point for the 5th ring. 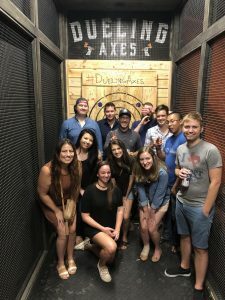 10 points for the blue balls, also known as the kill shot. The kill shot is only available on the tenth and final throw of the match. Otherwise the blue balls are worth 1 point (the value of the ring they are in). During the final throw of the match, the coach will provide a countdown starting from 3 (3,2,1), to indicate when the axes are to be thrown. On this final throw, axes MUST be thrown at the same time. 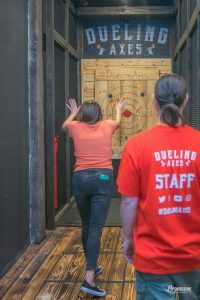 If an axe hits the target before the second player’s axe leaves their hands, the late thrower will be given 0 points. Touching the Line: If the axe is in 2 rings simultaneously, then the player is awarded the points for the higher valued ring. As long as the axe is touching the higher value ring, the higher amount of points is awarded. Stick and Stay Policy: the axe must remain in the target for the throw to count. If the axe falls out before the axe is retrieved, then the throw will be counted as 0 points. No Delays in Throws: Players may not “delay” in throwing the axe in hopes that opponent’s axe may fall out of the target or use delays for strategic advantage. 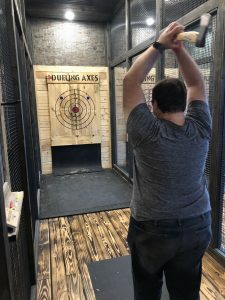 Oddball Throws: on the rare occasion that the axe sticks to the target with the back of the blade, the shaft of the axe or any other part of the axe, the throw still counts and points awarded accordingly. 1 hand holding the axe & over or behind the head. 2 hands holding the axe & over or behind the head. No other style of throws are permitted. Rotation: the axe must make approximately 1 rotation in order for it to count. If the axe is close to making a full rotation (ie. 50% rotation) and a portion of the blade touches and sticks to the target, the throw counts. 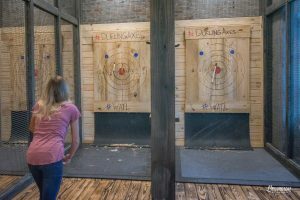 Players will throw from the boxed area marked on the floor, 12-15 feet away from the targets. Each box is 3 feet wide. Players must have their lead foot in the boxed area when throwing the axe. The other foot (back foot) may be behind and outside the boxed area. Players will not be penalized if their back foot is touching any lines in the box. A player’s lead foot is allowed to touch the front line during the throw but no part of their foot may cross the line. 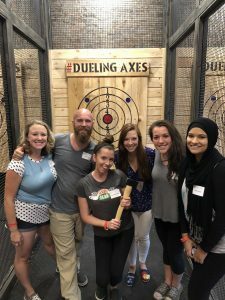 If any part of their foot is over the front line at the commencement of their throw or at or after the release of the axe throw, their throw will be counted as a zero. If any part of their foot is over the line after the axe is released the throw is valid and counted. Players may not step forward, over the line during their axe throw. This exception is after the axe has been thrown/released and the player’s momentum pushes them forward, past the line. Players are allowed to arrive up to 1 hour late, after official league start time. Players are allowed to leave up to 1 hour early, prior to the end of the scheduled official league time. The player that was scheduled to go against him will be granted an automatic win, but will perform 10 throws and have their points recorded. The late player will automatically receive a loss and a zero for all throws. Exceptions are allowed with consent of opposing players affected that day and approval from referee. Players are required to arrive to the playoffs at the start of regulation play. If a player is not present when their match begins, a 10 minute grace period will be offered. If the player does not show up, they will forfeit their match and the player that is present will be awarded the win. If the player arrives during their grace period, but is late for their next match, they will be immediately disqualified. Players are allowed to miss up to 2 days of regulation play during the season. If games are missed, those games must be made up within the following week. If the games are not made up within 1-week, all missed games will be marked as a lose and the team will receive zero points for all missed games. Players must make up any missed matches by the following week of the missed matches, otherwise, a loss will be attributed to their absence with a score of 0. No missed matches and throws are to be performed during week 8 (playoffs) – the seven week mark is the cut off. In order to miss a regulation league night, players are required to give a minimum 1 day notice to the referee of their absence. The axe head can weigh up to 2lbs maximum. The blade on the head should be no longer than 4.75″ maximum. The handle may be made of wood, steel or plastic and length be at least 12″ inches long, including the handle in the eye of the head of the axe. The length includes the top head of the axe where the wood is inserted, to the bottom of the shaft. Coaches must always be present while members are throwing during league play. 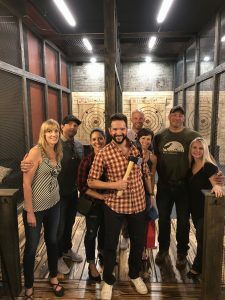 A 6′ radius should be maintained around every participant holding an axe, however, the coach may approach the participants and enter this 6′ radius to provide instruction. 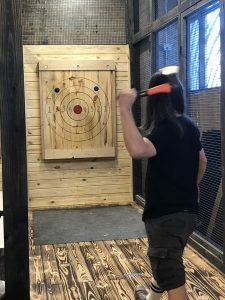 An axe should never be thrown until a coach has provided a demo and instruction for which the participant has been present. Throwing: Axes from each player should be thrown at the same time. 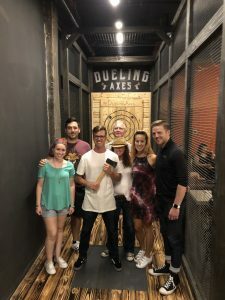 If an individual throws an axe after the other axe has hit the target, the individual who threw their axe late will have their throw disqualified and counted as a zero. Coaches may give up to 2 warnings per match to individuals who throw up to 3 seconds after the first throw (when both players are at the line and ready to throw). Coaches may give up to 2 warnings per match to individuals who are throwing too early. Axes are to be retrieved only when both axes have hit the target or the floor. 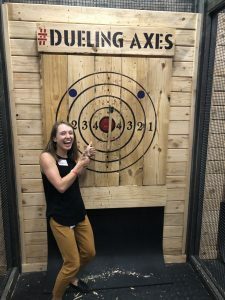 Axes shall never be thrown when a participant is picking up an axe from the target area. This will result in an immediate disqualification (counted as a loss) for that match. Axes – Each and every axe is inspected prior to each league night to ensure the axe is up to standard. Broken axes may not be used. Coaches ensure the blades of the axes are sharp enough to hit AND stick to the target, but are not razor sharp to the touch. Participants are instructed to grip the axe by the handle and only the handle. The entire season lasts 8 weeks including playoffs. There are 7 weeks where players can work on their season total allowing for 280 throws that officially contribute to each player’s season standings. The top 16 of players with the most points will make it to the final week of playoffs where a champion is crowned. In the event of a tie at the end of the season, the amount of match wins will determine the standings for playoffs. If less than 16 players then it will be the top scoring 75% of players. A Minimum of 8 players to a Maximum of 16 players may qualify for the playoffs. The player with the highest score will throw against the player with the lowest score. The second highest scorer from the regular season is matched against the second lowest scorer of qualifying players and so on so that the two players with the median scores are matched up. 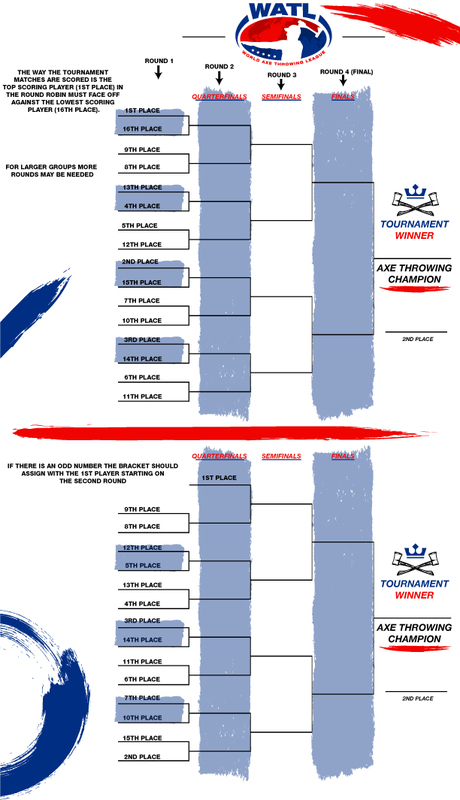 The tournament follows a single elimination structure for each round except final round. The winner of each match consisting of 10 throws, except in case of tie-breakers, advances to the next round. The final round between the two potential league champions will be at most 50 throws. Each player will throw 5 times on their respective target before switching to the other target. The Winner: will be the person who wins 3 out of the 5 matches.